Engineered to deliver precise magnification and crisp, sharp images, this microscope features 45° inclined eyetubes with interpupillary adjustment from 55mm to 75mm, a 10x wide field locked-in eyepiece, and 1x and 3x objectives. 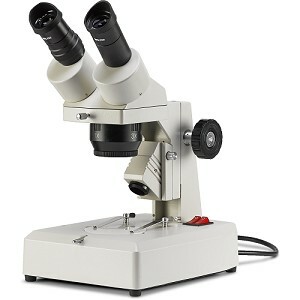 The microscope utilizes top and bottom LED illumination and features heavy-duty rack and pinion focusing with slip clutch and tension adjustment. Other features include diopter control in the left viewing tube, coated optics, and locked-on stage clips. Dust cover, frosted stage plate, and reversible black/white stage plate included.